BioShock Infinite...This is, perhaps, one of the most interesting games in the BioShock series (which is a lot from me considering I'm not much of a fan). Available on Xbox 360, PlayStation 3 (PS3), and Windows PC, it is awesome on all systems. If you have a PC, then you can even get it through both Origin, as well as Steam. 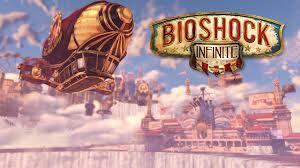 This particular BioShock takes place in a floating sky city full of racist people! Like -- oh my! So BioShock Infinite has several levels of difficulty. The regular ones -- easy, normal, hard...And one called 1999 Mode. What's 1999 mode? It has less respawn points, money is hard to come by, death has more penalties, enemies are harder, you are weaker, etc. How do you enable BioShock Infinite's 1999 mode? There are two ways.